Each SRPA member will be provided with a Campaign Package from their SRPA Lodge. Please ensure your name, lodge and campaign package # is recorded on your Campaign Package Cover Sheet. Please be sure that this number has been recorded by your Lodge. Each SRPA Lodge will determine who will contact which local establishments. Please write the businesses names on the Campaign Business List that is included in the Campaign Package. Beginning in February, volunteers will help recruit local establishments that are on their Campaign Business List. Please record the date you contacted the business as well as their contact information. 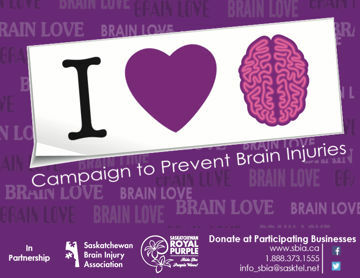 Once an establishment agrees to partner with the BrainLove Campaign, please provide them with the following items: Thank You Brochure, BrainLove Poster, 5x8 Envelope (used only when collecting cash) and a bundle of 50 BrainLove Stickers. On a weekly basis, please monitor how the supply of stickers is at each of the participating establishments and replenish the supply as needed throughout the month of March. On April 1st, please collect the funds donated and the remainder of supplies from each of the participating establishments. While collecting the funds, please ensure that you fill out the Acknowledgment of Donation Pickup Form. Please give 1 copy to the business, 1 copy to SRPA and the original to SBIA. On the Campaign Business List, please record the amount collected from each participating business. Once filled in, place the original receipt & cheque from each individual business in the envelope provided. If a business turns in cash instead of a cheque, it would helpful if the SRPA member would submit a personal cheque or money order made out to SBIA. Please return the Campaign Envelope as well as your BrainLove Campaign Package to your SRPA Lodge no later than April 4th.